We love Italian food, pizzas, pastas, salatas etc… Compared to French cuisine, I have described Italian food to be more down-to-earth and homely. Pizzas have always been one of our favorite things to look out for whenever we dine out. But it boils down to the usual few joints. One of our favorites is a pizza deli located along East Coast Road. What caught our attention initially was how they had named their pizzas after donnabellas, lady names like Arabella, Rebecca, Juliana, Vittoria etc. Our frequent order is Isabella, a simple Pizza con Prosciutto en Rucola, i.e. 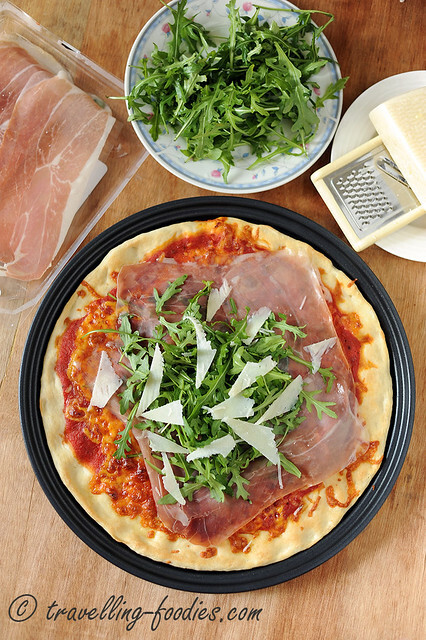 Parma Ham & Rocket Pizza. And this was precisely what I had for lunch today. Only this time, it is entirely homemade!